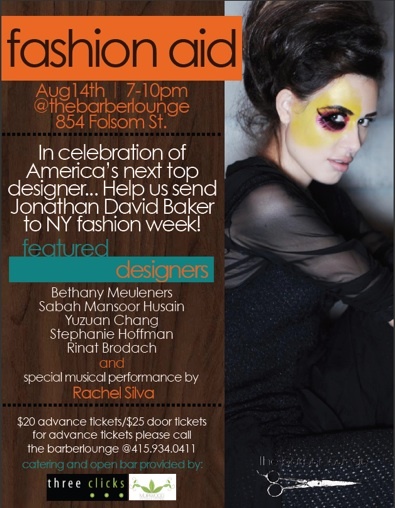 This Saturday, August 14th from 7-10 PM, the barber lounge on 854 Folsom Street is having a fashion fundraiser to help MFA Fashion and Knitwear Design student Jonathan David Baker raise funds for his collection. Jonathan is working towards the New York Fashion Week show in February 2011. Former classmates, Bethany Meuleners, Sabah Mansoor Husain, Yuzuan Cheng, Stephanie Hoffman and Rinat Brodach are loaning their collections for the evening’s fashion show with a special musical performance by Rachel Silva. Catering, open bar and are over 20 raffle prizes!